Of all the railway groups I’m a member of on Flickr, none has been more helpful and inspiring than the Progressive & Artistic Railway Photography group run by Martyn Fordham. Now, the members of the group, with Martyn and Ian Cowley taking the lead, have created a blurb photo book showcasing the work of many of the photographers who contribute to the group. 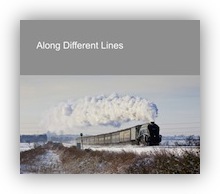 It was decided to call the book “Along Different Lines”, which I think reflects the group’s focus on, for want of a better cliché, thinking differently about railway photography. I was flattered to be asked to contribute five shots to the book, as well an introductory paragraph, and explanatory captions. You can buy the book from the Blurb website, but, since it’s a hard-back book, it’s not cheap. Since the book was not created to make money, and is being sold at cost price, I have no compunction against including my contributions (text and images) below.